Entropical is a research project started in 2015, the international year of the soil, to contrast abstract value creation with new paradigms in distributed energy usage and value re-cycling. 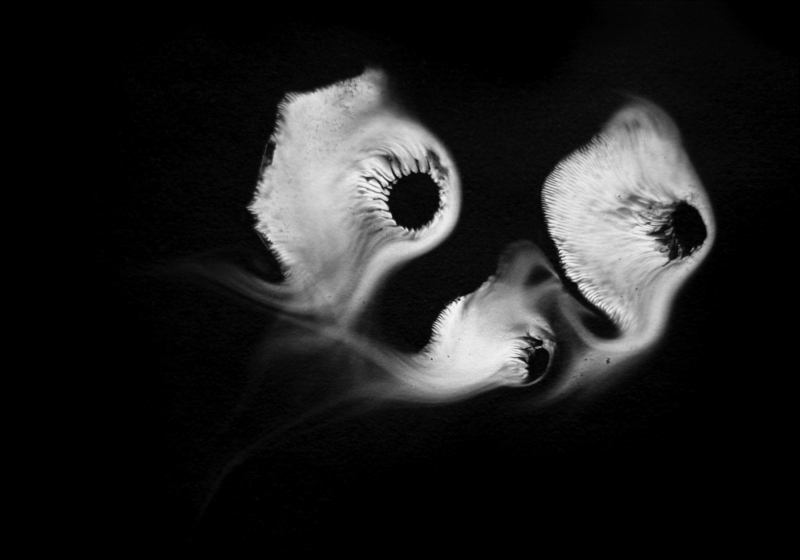 Conducted by artist duo Debra Solomon and Jaromil, Entropical is an inquiry into the incentive to produce soil ecology and food at a human scale in an age in which the best value is created by abstract algorithms and computer calculations. How can we bring these value systems into a direct productive relationship in a time in which intensive computation is valued far more than ecological regeneration? How, for example, can Bitcoin positively affect the rhizosphere, the layer of earth around the roots of plants? And how mycological processes affect and inspire digital systems like a cryptographic blockchain? Entropical plays with the concept of ‘entropy’, the second law of thermodynamics, a condition of constant change in which materials and energy are transformed. But the term is also used in cryptography, where it refers to algorithmic processes and abstract information. The first Entropical exhibition will take place in the Glazen Huis of Amsterdam's Amstelpark for a period of 2 months from 13th December 2015 to 14th February 2016, with various events taking place on the site. VALUES AND YIELDS on ecosystems and financial exchange. Hosted in Het Glazenhuis, co-moderated by the Entropical artists. Free entry. Here the Zone2Source flyer. Under the guidance of Debra Solomon participants will produce their own block of edible tempeh that will ripen in two days within the Entropical installation. The tempeh blocks can be picked up during the opening on December 13 or the finissage on February 14. Register for the workshop sending an email to entropical@urbaniahoeve.nl with subject Tempeh Workshop before December 4 or January 29. Debra Solomon and Jaromil Rojo discuss the background of digital mining and the possibilities and contradictions of connecting digital / technological value creation with the practice of ecological regeneration and urban agriculture. This first presentation of Entropical consists of four main art series in which the value and dynamics of the exchange of materials in the biological world is set against the abstract value of algorithms and computer calculations. The Entropical exhibition includes a technical installation and various typographic works and silk screens suggesting connectiong between natural processes and network architectures. The title 'Realbotanik' references the term 'Realpolitik', observing the deranged value attributions for resource exchanges within the soil organism and within computer networks. The pragmatic relation between the two systems becomes pronounced as the anthropocentric attribution of exchange value dominates a world that necessarily depends on the resource exchanges taking place between the roots, bacteria and fungi populating the soil. Cardboard mats inoculated with oyster mushroom grow mycelia reusing the (thermodynamic) entropy released by computers as heat, while a sophisticated Bitcoin miner gathers the (cryptographic) entropy necessary for its intense computation, connected to a rhizomatic network of on-line peers. Once placed in the soils of (urban) gardens, these mycelial mats (art object substrate) will produce protein and nutrients in the form of edible mushrooms and increased soil fertility. Computational activities are deployed for the creation of digital assets: immaterial sequences of numbers have more market value than most material objects. Warmth, a by-product of an information industry that relies on scarcity, is recycled to grow nutrients on abundant urban waste materials. Ten exemplars in total, a collection is touring across England as part of the Soil Culture arts residency, Centre for Contemporary Art and the Natural World. 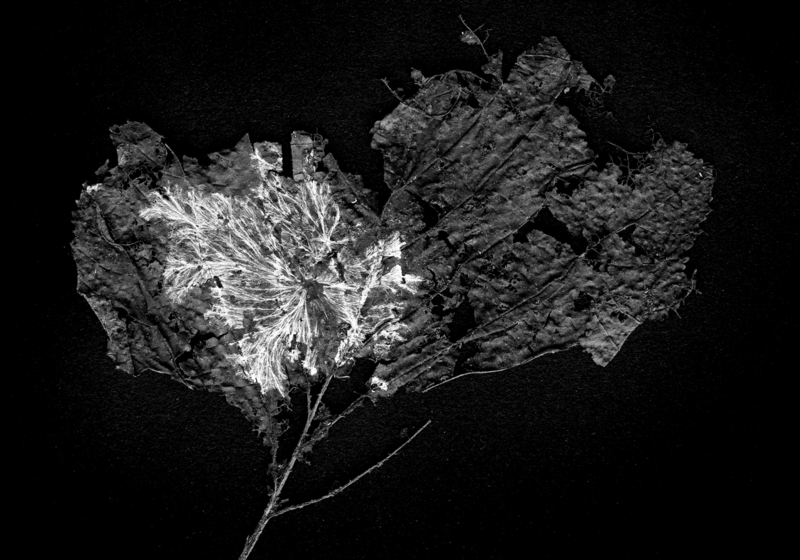 Five silk screens portray one of the soil's most valuable resources: the dead materials of the soil, called necromass. 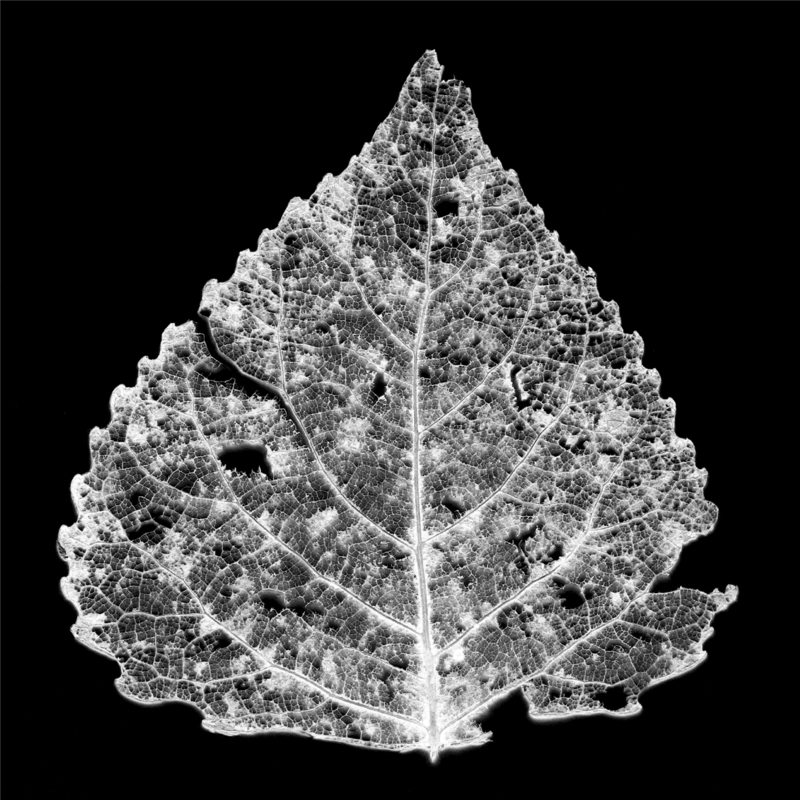 Skeletons of leaves show what has been and what has still to be deconstructed by bacteria and fungi, a mycelium majestically colonises a dead leaf, the spores of the parasitic oyster mushroom leave ghostly fungal drawings. Dead materials become soil. 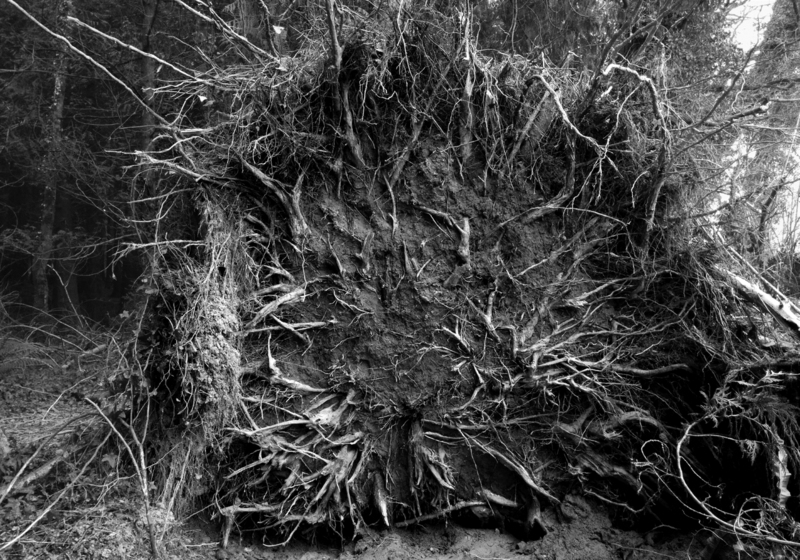 The chaotic episode of a falling tree reveals a root structure. The habitat of uncountable billions of organisms is transformed into a joyous feast for fungi. Fine print and installation "Resist-Exist"
RESIST-EXIST describes the tactics of the natural world. In Latin, the lingua franca of plant taxonomy, the word “existing” (esistere) overlaps with that of “resisting” (resistere). This artwork goes beyond the realization of a syntactic ornament of pearls of language and depicts the somehow tragic posture of nature across the industrial process of technology. The empirical yet invisible pragmatism and resilience of nature in transforming itself is perhaps the main advantage it has on technologies that stay identic, and are made to last forever. A single screen print presents the different functions of plants in a forest along side the logical layers of software. The seven layers of Permaculture are on the left and the Open System Interconnection (OSI model) on the right, showing the inter-dependency of seven layers in each different context. Seven Layers builds a metaphor by juxtaposing and interconnecting systemic organizations of knowledge and operates a context shift to inspire new impossible associations. It attempts to paint new colours for the semantic perception or reality, behind our eyes. By building impossible analogies and visionary relationships this artwork invites viewers to roam freely across the knowledge and perception of material and immaterial dimensions. Entropical unfolds a theoretical discourse inspired by D-CENT and in particular the publication Managing the commons in the knowledge economy as a critique of financiarization and the new conditions of material labor, use and exchange value creation between the physical and digital dimensions. Entropical is co-produced by Urbaniahoeve Social Design Lab for Urban Agriculture and Dyne.org think &do tank. Production manager: Marlous Verburgt. Screenprints are realised with great patience and fine attention to details by master screenprinter Kees Maas. The spore inoculations in the REALBOTANIK installation have been realized thanks to the support of expert mycologist Bas van Oostrom. The first exhibition of Entropical is hosted by the Zone2Source initiative, kindly supported by Gemeente Amsterdam Zuid, Amsterdams fonds voor de kunst and stichting Stokroos. All the materials presented on this webpage are Copyright (C) 2015 by the Entropical art collective and distributed under Creative Commons license (BY-NC-SA) and can be relicensed for commercial publications upon written agreement.